Our Canine Condo is featured by the iKea Hackers. We want to give our dogs their own private room where they can rest peacefully at night. Where they can stretch out and not worry about guarding the house or being bothered by one of the others in their pack. This condo, which we call Tokyo Towers (because our Japanese breeder is from Tokyo), was the perfect solution. It is sturdy, offers ventilation around each crate, and looks like a very nice custom feature in our home. 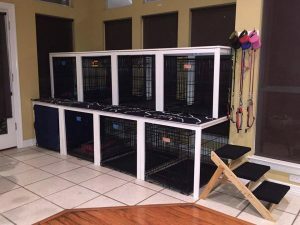 Even if you have only one dog, having a table over the crate offers you more storage room. Another very fun toy is this Kong Jumbler Ball. Our Shibas are first intrigued by the yellow ball inside the big ball and they spend a lot of time trying to get it out. But when they finally accept they cannot get that little yellow ball, they take out their frustrations on the big ball. It is durable and long lasting. We have both the medium and large sizes. Planet Dog has great balls! They are super bouncy. 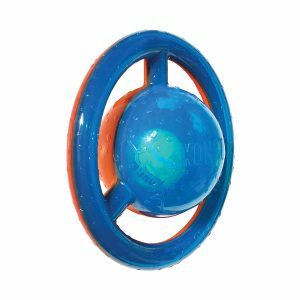 The dogs love to play fetch with these balls, but they also play with them on their own. They throw the ball then chase it as it bounces around. These balls are sturdy and last a long time. 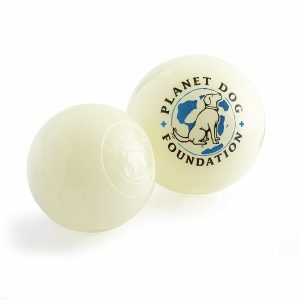 Planet Dog balls are lighter in weight than the Kong ball. Also, they are softer, have more give than the Kong ball, and are easier for the dogs to gnaw on. Don’t worry, these don’t crack or peel. We have some that are a few years old and are still in great condition! The best size for a Shiba is 2-1/2″. Beni rates the elk antlers 5 out of 5 paws. She has never required dental care; as is true of all our Shibas. Our vets are always amazed at the health and quality of our dogs teeth. Part of that is genetics, part is their diet, and the other part is having great antlers to chew. I recommend them over any chew toy on the market. The antlers are healthy for your dogs; they contain calcium. They are very hard, so your dog will spend hours chewing them and the antler will show little wear. Most importantly, they don’t splinter and bits can’t be pulled off. Elk Antlers (far superior to anything Nylabone or Kong can offer). 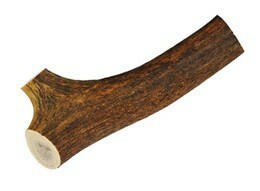 Bark Avenue offers premium quality Elk Antlers at the best prices you will find. 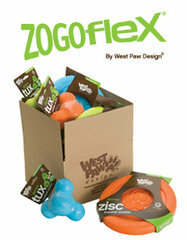 Another favorite are the Zogoflex dog toys which are tough, nontoxic, dishwasher safe and guaranteed for life! iFetch is a great toy to entice the intellect of your smart little Shiba Inu. We have ours on order; we’ll let you know what the dogs think of it when it arrives! Created by our local central Texas neighbors. iFetch … check it out!